Bokhara couching is a filling technique used in surface embroidery. Unlike regular couching, Bokhara couching uses only one thread, which serves as both the laid thread and the couching thread. 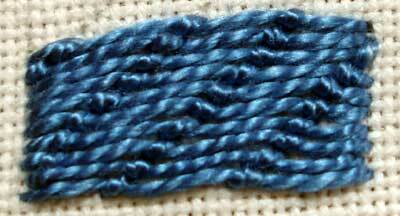 Here’s some information on the stitch, as well as a video tutorial to help you with it. First of all, there are heaps of variations that can be worked with Bokhara couching. 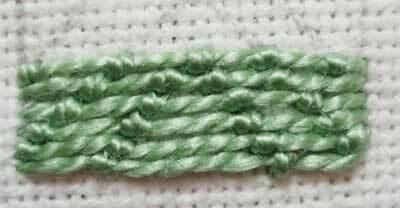 It’s a great couching stitch for forming patterns in your couched threads. Some embroiderers demonstrate Bokhara couching with a horizontal straight stitch couched down by vertical tiny straight stitches; others show the couching stitch alternating placement row by row (to form a bricking pattern). The point is, you can really work out any kind of overall pattern to your couching stitches – there’s no “one look” to Bokhara couching. There are other types of “self couching” techniques (where the couching stitches are worked back over the laid thread, using the same thread) – Roumanian couching and Klosterstitch come to mind. The difference between these couching techniques are subtle. The principle difference between Bokhara couching and Roumanian and Klosterstitch is that the couching stitches are generally small and very visible, forming a pattern. In Roumanian couching, the couching stitch is meant to work back into the design, making a subtle textured difference, but not highly noticeable. With Klosterstitch, the couching thread is meant to be as invisible as possible – yes, it necessarily forms a kind of smooth texture overall, but Klosterstitch is meant to fill a solid area without creating any kind of secondary pattern on top of the couching. This is Bokhara couching. Notice the small couching stitches, and the diagonal pattern being formed by them. Here’s another shot of Bokhara, with a different pattern worked up. The design is being worked in an inch square, with #5 perle cotton. Not a very good choice of design with that thread in such a small space, but just so you have an idea. Here’s Roumaniann couching. Notice that the couching stitch (that’s the middle “wave”) is much longer, and it doesn’t really serve to form as visible a pattern, although there is a noticeable wave and a difference in texture (it isn’t a smooth line, like satin stitch). Here’s Roumanian couching with two couching stitches across the laid thread. A note on the three forms of couching: According the Historical Needlework Resources website, all three names – Bokhara, Roumanian, and Klosterstitch – are used interchangeably. I don’t want to be argumentative about it, but for the most part, it seems to me that they are subtly different. Klosterstitch is even “less visible” than Roumanian couching – and, from what I’ve seen looking hither and thither about the place, Klosterstitch is more often worked on the vertical rather than the horizontal. I suppose this is a matter of the stitcher’s preference, though. In any case, I’d put Klosterstitch and Roumanian couching a bit closer in looks than I would Bokhara, because it seems to me that Bokhara couching is always described using small couching stitches that form a pattern on top of the laid threads. The other two don’t. All that having been said, if you’re looking around, trying to figure out how to do Bokhara couching, you probably don’t care about the differences and similarities! So I’ll get on with the video! For more embroidery stitch videos, please visit my collection of how-to videos for hand embroidery here on Needle ‘n Thread, where you’ll find over 75 embroidery stitch videos! I like this stitch! I didn’t know there was a different name for different kinds of couching. I thought it was just all called couching! Hi Mary, I don’t recall seeing this earlier in the year, I just jumped here from clicking on your pic in Stitchin Fingers. These comparisons always fascinate me. Do you have any samples of Klosterstitch, or instructions for how to work it? awesome job, i just want to know can u adapt this for different shapes? I used this stitch for the roof of a house which I stitched on a sampler for my parents’ wedding anniversary. I used small diagonal couching stitches to give the impression of the roof tiles sloping down the roof (to give “perspective”). I “bricked” them (spaced them above each other on alternative lines, like tiles on a real roof). It worked fine. In fact it was one of my favorite bits of the whole sampler (which took about 8 weeks to complete!). I might consider doing a long/short stitch … especially using at least 2 different colors, maybe the short stitch at the edge to ‘show’ a curve. My experience with satin stitch hasn’t been to my liking, probably because I tried to cover too large an area. I noticed that you used the bokhara couching to fill squares mostly. Can I use it to fill in something that has a curves and contours in it? Thanks a lot Mary, I will give it a try! Thank you so much for your great work! Inspirational….I am going to try this with rocks and clouds and water! Thank you for these videos. They are amazing! Previous Previous post: Making Embroidery Stitch Videos – What a Hoot. 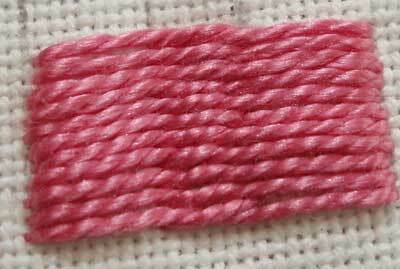 Next Next post: In Search of the Elusive Plaited Braid Stitch!